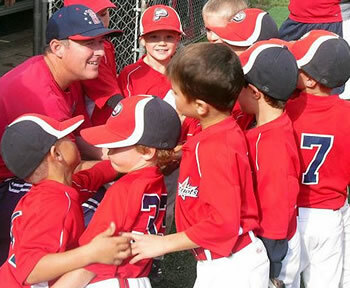 Jay Lucas loves coaching baseball players on all levels…league teams, all-star teams, travel ball, tournament teams and camps at every age including the high school level. He is currently the pitching coach with former MLB All-Star Jack Wilson at Thousand Oaks High School. Jay’s baseball passion is three-fold. Teaching players to play the game the “right way”—building character on and off the field (learning life lessons). Building overachieving, unselfish teams where the total is greater than the sum of the parts. Preparing players to compete at the highest level—increasing their chance for success (in baseball and in life). Players learn to respect the game and their coaches, as they take responsibility for their actions, mature, and learn what it means to be a good ballplayer, a good teammate and most importantly, a person of good character. Don’t expect Coach Jay to teach one specific “system” or take a “one size fits all” approach. Rather, he likes to coach each player as an individual, making adjustments and improvements to their natural mechanics and techniques. “Get ahead, stay ahead” is a key concept. If young players get quality instruction and repetitions at an early age, they will consistently be the more advanced players all the way through their youth baseball experience. He believes athleticism and talent become more important after puberty and into the high school and college years, but attitude and effort must be emphasized first as a solid foundation. His coaching resume includes over 1,000 wins and about a 90% winning pct. Those wins were team efforts with incredible coaching staffs that included Tom Costello, Ed Perez, Jeff Campbell, Jim Watson, Bill Tessar, Michael Rainer, David Hernandez, Scott Hansen, Jay Sramek, Craig Hewitt, Ken Gill, Darren Campbell, Bobby Teegarden and others through the process. Some highlights include 6 Pony Baseball All-Star World Series Championships (2005, 2009, 2013, 2014, 2015 & 2016), plus 2 Pony World Series Runner-Up Finishes (2010 & 2017), 2 USSSA World Series Championships (2005 & 2017), 3 (back-to-back-to-back) Winter Nationals Titles in AZ (2006, 2007, 2008), 3 exciting Cooperstown Dreams Park Trips (2006, 2007 and 2009) and a bunch of other league and tournament championships. The current SYB all-star team has an amazing streak going with Pinto-7, Pinto-8, Mustang-9 & Mustang-10 World Series Titles including a perfect 112 straight wins and counting. Many of Jay’s past players are now impact High School and college players hoping to take the next step into professional ball. Some of those guys include: Blake Rutherford (NY Yankees – 2016 1st Round Pick), Tommy Costello, Matthew Campbell, Terrell Tate, Easton Lucas, Kyle Ohanian, David Gaydos, Griffin Mazur, Lorenzo Perez, Jordan Athey, J.T. Watson and others. Does this all sound like something you want your player to experience? If so, great! Jay is now offering camps and clinics at Simi Youth Baseball. Contact Jay to ask about personal and small group lessons with your player.